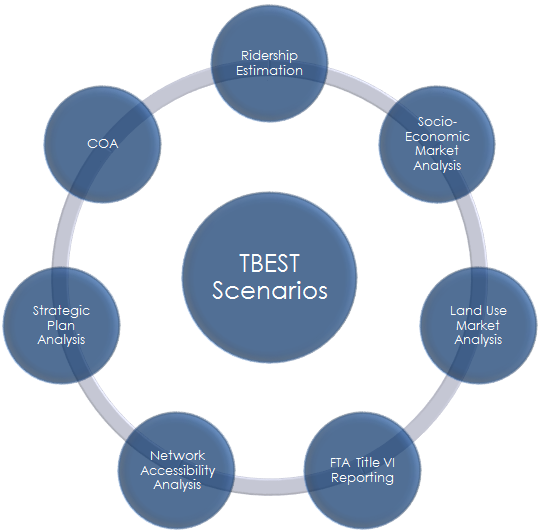 With the TBEST scenario-based planning framework, users construct transit alternatives to support a variety of service and strategic planning tasks including out-year modeling, market analysis, and network accessibility analysis. TBEST provides supporting functions for simple and complex tasks and analytical functions related to transit service development. Scenario Alternatives – The core of the TBEST framework is the creation and management of transit system scenarios. 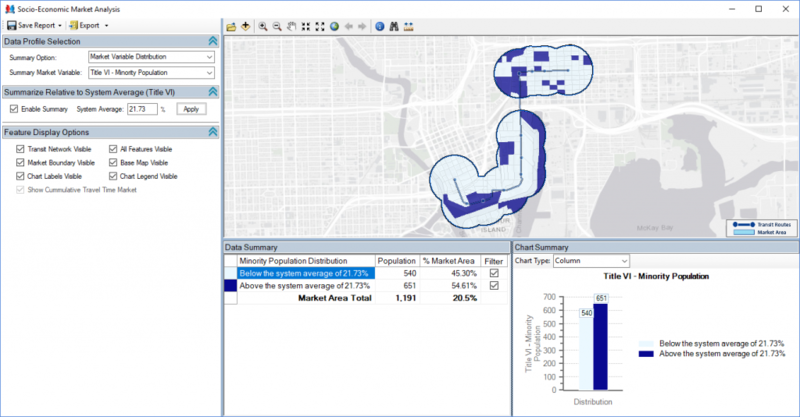 Scenarios contain the data components required for TBEST modeling and market analysis including the transit network, socio-economic data and growth rates, land use data, fare structure and many additional attributes. 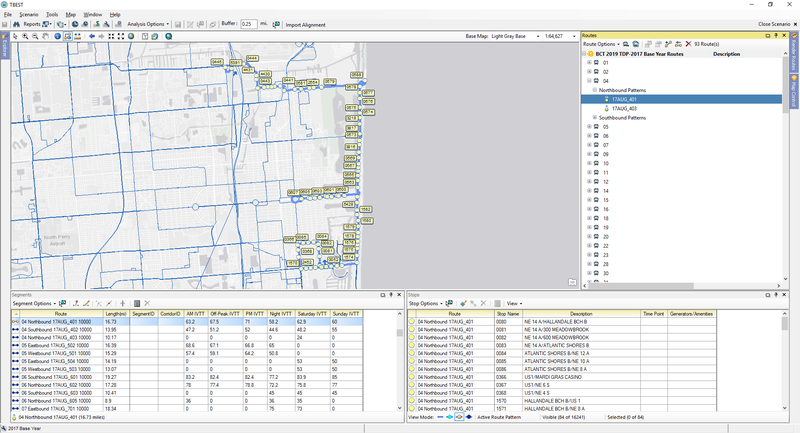 Network Editing – The TBEST Transit Network Editor contains all elements for creating and managing route definitions including multiple patterns per route and segment and stop digitizing. The editor includes tools for defining route service span, travel times, headway, stop amenities, special generators, transfer stations, and interlined routes. Title VI Proximity Analysis Support – The TBEST Market Analysis and Network Accessibility Analysis tools are equipped to assist transit agencies in evaluating routes and stops for FTA Title VI compliance. Within a defined distance of a route or pattern, TBEST socio-economic variables can be summarized relative to the calculated system average. The user is provided a summary both above and below the system average and a map distribution of the results. The TBEST Title VI toolset supports full service equity analysis. Corridor and Site Analysis Tools – TBEST provides tools which enable the user to define and save unique geographic markets or areas of interest within the system service area. 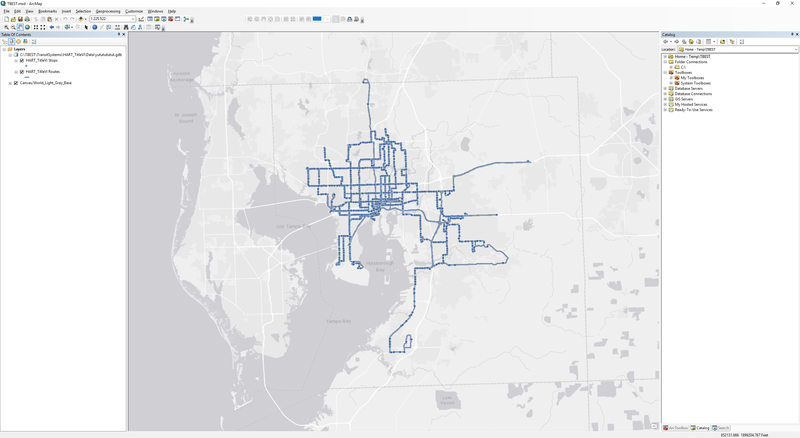 The areas can then be used to select stops, summarize ridership, update socio-economic data, summarize markets or be used in network accessibility market analysis. Mobility Planning – The incorporation of Mobility Planning functions within TBEST was on the need to analyze specific growth areas for their impact on transit. TBEST provides tools to develop recommendations for transit improvements to meet the estimated demand. The Mobility Area Thresholds allow users to input ranges of additional trip numbers with associated recommendations for service improvements that constitute adequate transit improvements to meet the additional demand. 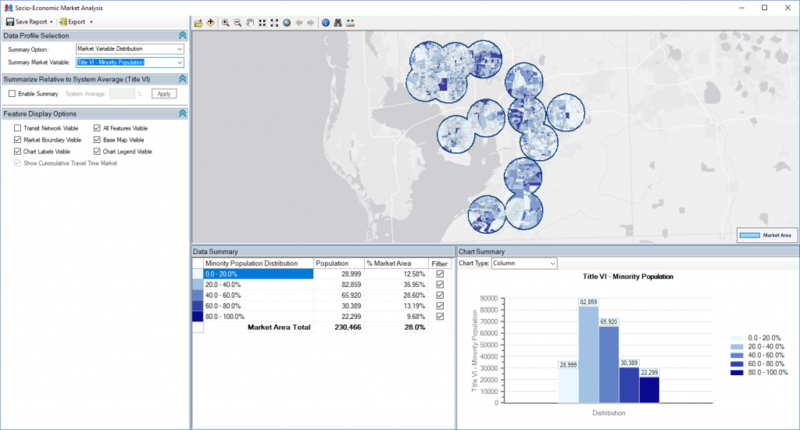 ArcGIS Integration – TBEST utilizes the ArcGIS Engine framework to develop, display and analyze spatial features. TBEST map components function similarly to ArcGIS components and all spatial data is stored in ArcGIS formats. Users are required to purchase an ArcGIS Basic (or greater) license to run TBEST.